Is it possible that I have to change Master and Slaveaddress? address 08: slave #11, scanned "MF=Vaillant;ID=V3x00;SW=011;HW=9902"
Or do I still need other Config-Files? So, Autodiscovery finds nothing or only not your Vaillant device. This binding has only a subset of devices compared to to ebusd. Can give us the device type ? I’ve released a new version, you should try it with this version. But you defined the thing by hand, a VRCxxx device with slave address 08, but your ebusd log shows 15. Could you try this, if auto discovery fails. Slave address 08 is for BAI things as far as I know. 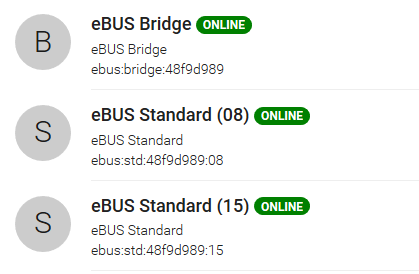 Hello there, does anyone knows how to order the board for the ebus adapter, please? address 15: slave #2, scanned "MF-Vaillant;ID=47000, SW=0420;HW=1403"
can you send me a complete log file from a fresh openhab start, so it contains 5-10min. You can send it via PM, if it contains sensitive information. I’ve now stopped ebusd on my FHEM-RPi so that ebus-adapter will be free and rebooted my other RPi with OH2 over VPN. When I will be at home I could send you the complete log file. What do you mean exactly with “But you defined the thing by hand” ? I disabled the .thing file and followed the configuration instructions the github readme. Is there another way ? Right now, there is only the Vaillant bai and the Tado extension kit on the ebus (also the ebus bridge of course). I will try to install the newer version, see if that helps. 05:48:11.831 [DEBUG] [de.csdev.ebus.core.EBusController    ] - eBUS collision with SYN detected! 05:48:11.968 [DEBUG] [de.csdev.ebus.core.EBusController    ] - eBUS collision with SYN detected! 05:48:12.105 [DEBUG] [de.csdev.ebus.core.EBusController    ] - eBUS collision with SYN detected! I get below error messages in the log after installing the latest version 18 and creating a bridge thing, before adding the bai thing. None of the items is getting any value, they remain ‘Nan’. maybe the master address is still in use by another device link your Tado? You should try 00 or FF for your bridge. @csowada, how/where can I change the master address ? Is it a setting in the ebus binding ? its an advance setting in the bridge settings page in PaperUI. Or the binding setting? I’m not sure yet. Should be easy to find. how can i test the Brutforce analyzer to find some new values ? How can I solve this? I read some discussion about removing “linkRegistry”?!? This is new for me. Can you send a log. I use 2.2 stable in production and an older 2.3 snapshot for development. Its just a internal Java class, no console command yet. So only useful as a developer. Since my ebus binding is working I now wanna see some values. But there are a lot of Items who don’t delivers any values. So my first step, get Item an wait if there is an value. But this method isn’t really nice. Is there a possibility to list all values? So I can pick them up and make not try & error? Maybe something like _ebusctl find -d under fhem?